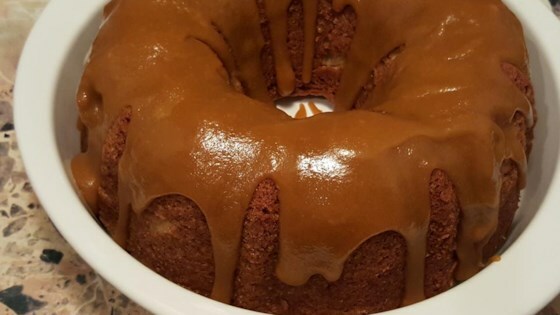 "This is a fantastic Bundt cake that my grandmother used to make for Thanksgiving. It has been a family favorite for years!" Make the glaze by heating the butter, milk and brown sugar in a small saucepan over medium heat. Bring to a boil, stirring to dissolve the sugar, then remove from the heat. Drizzle over the warm cake. I like to place a sheet of aluminum foil under the cooling rack to catch the drips for easy clean up. This was SOOOOO yummy! I used Splenda instead of sugar, the Splenda browqn sugar blend instead of brown sugar and added 2 extra apples. AWESOME, moist and sooooo tasty.